Was Sunday the Worst Day In Milwaukee Baseball History? ~ The Bucky Channel - The World of Sports from Wisconsin's Perspective. 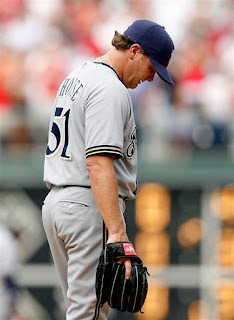 Home » Brian Shouse , Carlos Zambrano , Chicago Cubs , Houston Astros , Jeff Suppan , Miller Park , Ned Yost , Philadelphia Phillies » Was Sunday the Worst Day In Milwaukee Baseball History? Was Sunday the Worst Day In Milwaukee Baseball History? I'd vote for October 9, 1958 or October 20, 1982 as the worst day in Milwaukee baseball history, but whatevs. 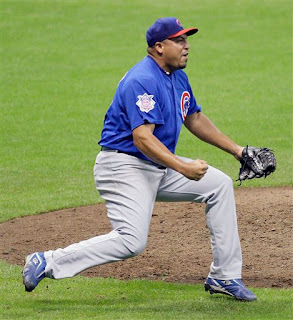 Dropping a double header and two games in the standings for the wild card, continuing to play terrible baseball, ALL WHILE the enemy is celebrating on our turf as "Wrigley North" comes true via the 26,000 Cubs faithful that watched the Zambrano masterpiece. I think that's enough to take the top spot. 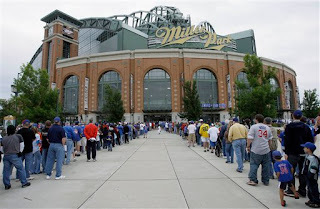 The worst day in Milwaukee baseball history is the day the Braves left, or maybe the WS loses. Yesterday was definitely up there though. The Brewers are backed in a corner now. I think they have to split the remaining 6 with the Cubs and probably sweep or only lose 1 in the Pirates and Reds series. That would give them 8 or 9 more victories on the year. I think that might be enough to get them in. For anyone keeping score, Prince was player of the game in the nightcap. It's right up there as far as worst day (24 hour period) in Wisconsin baseball history. I'd put it in the top 5. But there are still two weeks left, so there's plenty of time for it to get bumped down to a lower spot in the top 10.